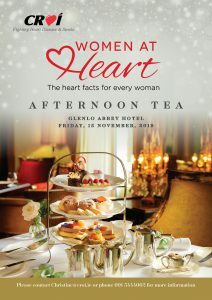 Join us for afternoon tea at the 2019 Women at Heart event, with heart facts for every woman. By registering for this event, Croí reserves the right to use any photograph/video taken without the expressed written permission of those included within the photograph/video. Croí may use the photograph/video in publications or other media materials. To ensure the privacy of individuals and children, images will not be identified using full names or personal identifying information without written approval from the photographed subject, parent or legal guardian.